The real world continues with my search for an apartment. Sure finding a job was one thing, but finding a place to live? A whole different game. Currently, my inbox is full of emails with subject lines like “27 housing recommendations,” and I have a Google Doc with comments like “gross” and “FAVE FAVE FAVE.” Half of my recent calls were to realtors. The other half were to my mom. Mental math is not my strong suit, but now I’m able to accurately guess rent per roommate fairly quickly, and if I don’t see the words “laundry in unit” you can bet that it’s not even an option. Landlords aren’t as scary as you think. Horrible pictures of bathrooms are. During my search for an apartment, I found myself googling “Top Sites To Find Apartments.” Well, Google didn’t really help recent grads like me, so that’s why I’m compiling this list. Here are the top 5 sites to find apartments with reviews and tips from someone who’s actually used them (A lot). I started with Zillow because you always see commercials for it, plus it has the cute tagline, “Find your way home.” I like Zillow for the most part. You can specify your rent range, number of bedrooms/bathrooms and home type. The map view is a little crowded, but the expandable side panel of options is helpful for searching. Most places have good pictures and a way to contact the landlord directly through the site. Overall, it’s a good place to start. Like Zillow, Apartments.com has pretty cool commercials, and I thought to look there next. Honestly, I was a bit disappointed. 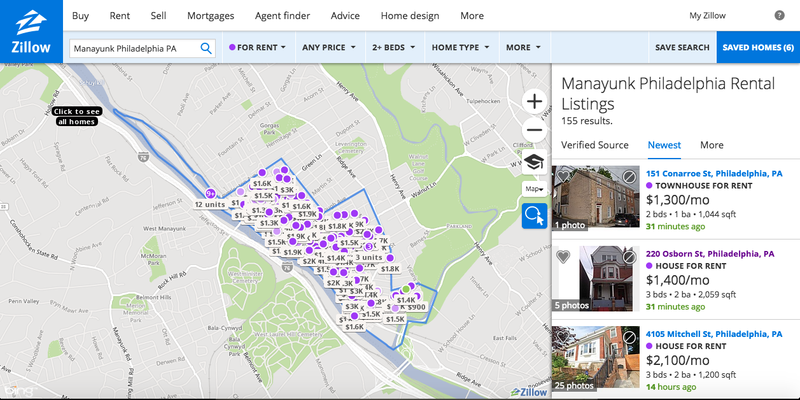 You can specify the same features as you can with Zillow, but the map isn’t really exact (for example, when I was looking for apartments in Manayunk, the site gave me all of Philadelphia). One redeeming aspect is that it provides commute times which is kind of cool. My suggestion is give it a look, but don’t spend too much time on it. Before you cringe and run away because of the sketchy stereotype, hear me out. Craigslist is actually an awesome place to find apartments. It does take a little searching and weeding through duplicate posts, but there were a lot of (affordable) apartments on Craigslist that I didn’t see on other sites. Plus, those landlords got back to me the quickest! Depending on the post, you might get a long description or a more concise one, but generally they’re pretty thorough. To contact the author of the post, go to the top left hand corner and click “Reply” and it will give you a Craigslist email. If you can get over the 1990 web design and occasional sketch factor, Craigslist is a hidden gem. I love hotpads. 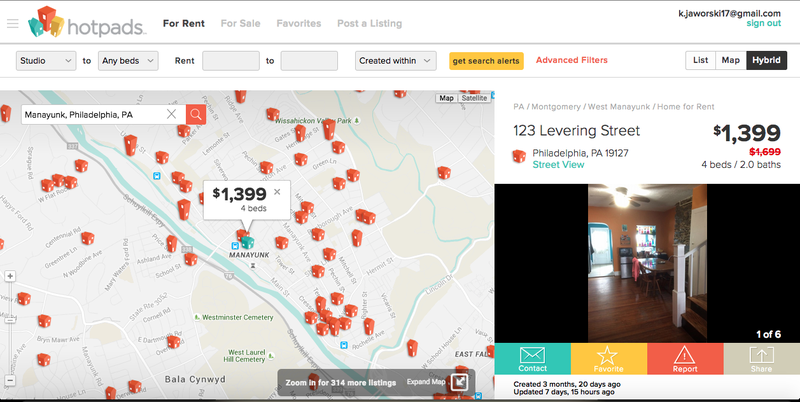 It’s very similar to Zillow and Apartments.com, but I like the map design better. It’s a great site if you want to live in a particular part of a city (like North of this street or a couple blocks from this intersection). The little houses represent available rentals with your designated features/price and turn grey once you view it. The site also allows you to contact landlords through the site, and they’ve replied fairly quickly so far. I’ve spent a large majority of my time searching on hotpads. 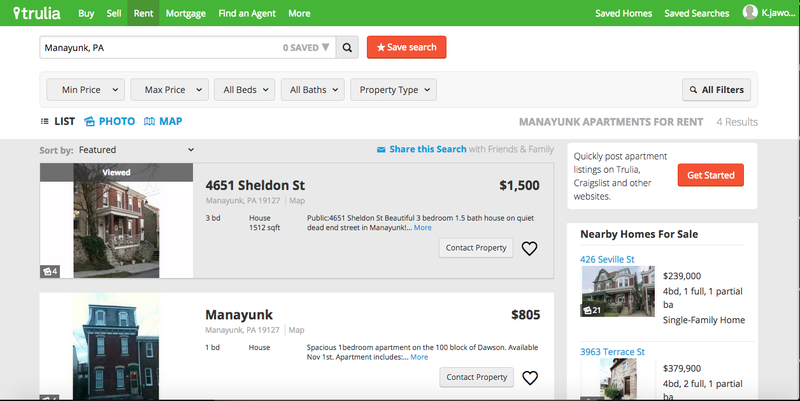 Trulia is a pretty good option just to make sure you’re finding all the options you can. It’s set up in a list format instead of a map, which might work better for your search. I found that a lot of listings didn’t have many pictures, but the descriptions are usually pretty detailed. Another cool thing is that it suggests annual income for the rental so you can ensure you’re staying within your budget! You can also calculate commute time easily here too. And now you know where to look, here are some ~*pro tips*~ for your search, aka things I wish I knew before I started searching. 1. Know your budget. Seriously. Just know it. Sit down with your parents or your S.O. who’s really good at finance and figure out exactly how much you can spend a month on rent. (Don’t forget to calculate utilities!) Oh, and stick to it. Don’t search outside of it. It will only make you sad. 2. Ask around. I started my search asking my friends whom I knew lived in the area about where they’re living, where they looked and what neighborhoods/areas to consider. Not only does it give you a starting place, but you my also find a roommate in the process. You never know who’s considering moving! 3. Contact a lot of landlords… but not too many. It’s good to cast a wide net and have a lot of options, but if you contact too many at once, you may end up with 6+ apartment visits in a week… which means multiple trips to the same city or consistently thanking your roommate who lives in the area for seeing back-to-back showings for the third time in a row. 4. Stay organized. Especially if you’re living with someone, make a good ol’ Google Doc and keep track of the important stuff. They will all start to sound the same and “the one with the okay bathroom” isn’t going to help you make a decision. 5. Consider small details. Does the rental have laundry in unit? What about parking? Do any utilities come included in the rent? When is the rent due? The more searching/visits you do, you’ll figure out your list of “must-have’s” and things to ask about. 6. Turn on the shower. I got this one from my best friend, Emily. When you’re going to visit a potential apartment, ask to turn on the shower. The realtor/landlord may look at you funny, but checking the water pressure can make or break a place. I still don’t have this whole apartment thing figured out, but I know a little more than I did a week ago. Hopefully this list of sites/pieces of advice help you become savvier house hunters. Happy searching! &.